Rick and Lynda Armstrong, owners of Furniture Medic MasterCare Experts of Wheaton IL, received the prestigious President’s Achievement Award during the annual Furniture Medic national convention. Furniture Medic MasterCare Experts was recognized for the largest percent growth in 2012 from among more than 300 Furniture Medic franchises in the US and Canada. At the awards ceremony, the Armstrongs, joined by General Manager James Smith, were praised for their dedication to business excellence, growth and stability. 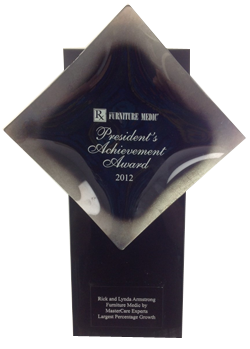 “In addition to having impressive business growth, the winners of the President’s Achievement Award exemplify the ServiceMaster Commitment both personally and professionally,” said Kathy J. Thiessen, Vice President & General Manager, Furniture Medic. Furniture Medic by MasterCare Experts serves West Chicago IL and the collar counties and expanded to a new location in Carol Stream in the fall. The franchise specializes in cleaning services and furniture restoration for both residential and commercial customers. Other services include furniture structural repair and stabilization, on-site precision repair of wood surfaces, refinishing, polishing and color matching. Kitchen Makeovers provide customers with the look of new kitchen without the high cost and inconvenience of replacing cabinets. « Smoke damaged kitchen cabinets: reface or replace? Should I Refinish or Replace My Kitchen Cabinets?